2018: School’s out Party’s over. Hi again. I know, I know, 2 posts in one week? Madness! On New Years Day I like to look back over the past year and think about what has worked, what has not, where things seem to be going and what new things I would like to explore in the coming year. Sometimes sacrifices must be made to allow other things to grow. 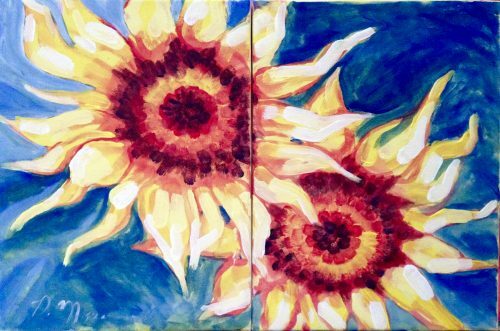 So, in order to put more energy into the studio, including some interesting projects that showed great potential for growth in the last year, for 2018 I am discontinuing offering Art Parties, Art Lessons and Artist’s on a Mission programs. I guess I’ll have to get new business cards made soon then. For around a year now I have been doing Art à la Carte parties, and I think I may be the only one! I haven’t seen anyone else doing them. There are art lessons and workshops. 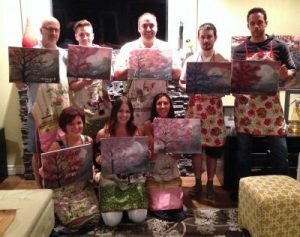 There are paint nights, wine and paint parties & art parties out there of all sorts. They seem to be taking urban nightlife by storm. But Art à la Carte? Now that is something different again. What is so different about Art à la Carte? I am glad you asked! 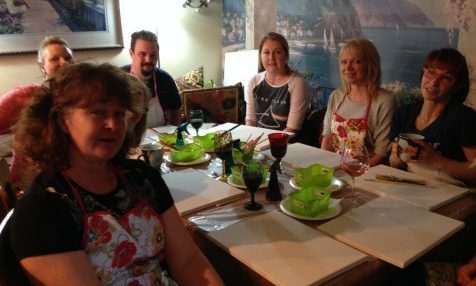 Typical art parties offer a social experience for participants where guests can wine and dine while working their way through a set painting project. Usually they take place at a bar, gallery or art studio, and are great as a date night, girls night out or alternative corporate party. However, if you would like a more intimate environment or a custom project, consider an Art à la Carte party. An Art à la Carte party brings the art party experience home, literally. So why would you want to do an Art à la Carte party at home? They are intimate, low pressure, and so flexible! Most art parties have set projects, set times, and require you to go to the venue. This can be a hassle if you have food and decorations to transport to the location. It can also be expensive if it is a bar and there is an expectation to purchase a certain number of drinks. Art à la Carte gets rid of the hassle of going out. Whether it’s a birthday party for a 9 year old or 49 year old, a baby shower, mixed ages event, or your turn to host dinner and drinks, an Art à la Carte party is a fun and affordable way to break the ice, or provide a new twist for a regular event. You control the guest list, book the time and the place (usually your place, though I have done off site locations too), and choose the project. You provide the space, including tables, chairs and water, along with the refreshments. I bring the art materials and equipment and I teach the project. Because the environment is much more intimate, guests find they can really relax and enjoy the experience, regardless of their skill level! I have done Art a la Carte parties for kids birthdays and for adults birthdays. I have done them for wine and cheese nights, girls night out, co-workers night in, and just for the heck of it nights with family and a few close friends. Because each event is custom tailored to you, there is a lot you can do with an Art à la Carte party. You can learn more about Art à la Carte parties here. If you are ready to book one now you can contact me here! Announcement: MOE will mark 10 Years!